is a woody-stemmed trailing perennial plant native to Italy and North Africa. 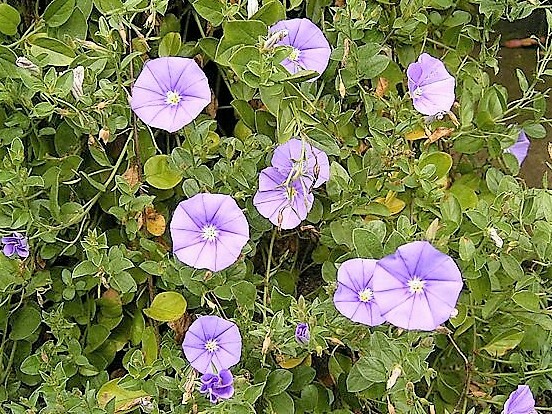 Often found and sold under the synonymous name Convolvulus mauritanicus, it is generally cultivated as an annual in the cooler climates of northern Europe. It has a tufted, mat-forming habit making it a popular as summer bedding. Under favourable conditions you can expect Convolvulus sabatius to grow to approximately 20 cm in height. It has slightly hairy, ovate to obovate leaves and light blue to violet, funnel-shaped blooms which appear from June to September. The flowers have a light-blue to white centre, and are approximately 2.5–5 cm in diameter. For best results Convolvulus sabatius can be grown in any well-drained garden soil in a sunny position. Water regularly during periods of drought and apply a liquid soluble fertiliser fortnightly once in bloom. Remove the seed heads as they form to ensure a succession of flowers. Convolvulus sabatius received the Award of Garden Merit from the Royal Horticultural Society in 1993.